IOTransfer is an iPhone/iPad manager for Windows. It can transfer media files between your iPhone/iPad and PC through WiFi or USB cable. You also can take backup, download videos, clean junk files, manage apps on your iPhone by using this tool. The iOS device users may be looking for a third-party backup and device manager for Windows. This IOTransfer 3 review is for them. It is a great iPhone, iPad manager that is not complex as iTunes. Generally, People uses iTunes as their iPhone manager for Windows PC. But, iTunes is complex. It doesn’t serve all our needs smoothly. So, We often want a tool that can do our job more conveniently than iTunes. In this case, A third-party iPhone/iPad manager can help. So, I’m here with the unbiased IOTransfer review. It is a software that can fulfill your needs. But, Wait. You should read the whole review before making your decision. What is IOTransfer? It is a software designed to manage iOS devices such as iPhone, iPad or even iPod from your Windows PC. It can do many things including photo, video, and file transferring between your PC and iPhone, taking the backup, video downloading etc. What else it can do? You will get to know now. These are the features of this software. All of them are well optimized. The IOTransfer can easily transfer your photos, videos, music, books, contacts, podcasts, voice memos etc. between Windows PC and iPhone. Everything is very easy to do. 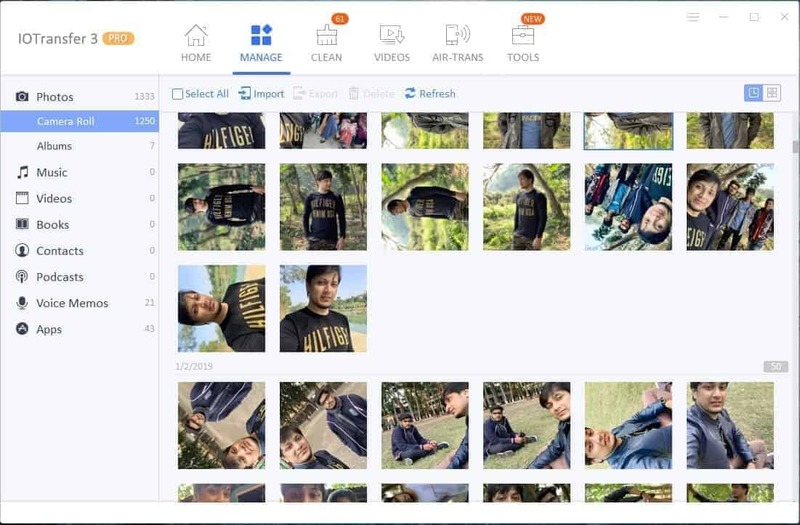 You can just browse your photos using this software, select an album or multiple photos and then transfer it to the PC. Also, You can transfer files PC to your iOS devices. By this way, You can take effective backup of your iPhone media files and contacts easily. You also can delete media files on your iPhone from your PC using this software. It is another mentionable feature. Now, You can automatically transfer HEIC format photos to JPG. HEIC format photos may not be supported in many devices. Modern iPhone 8, X, XS may capture photos in HEIC format. So, This feature is very necessary for you. This is probably the biggest feature of IOTransfer. Unlike many other iPhone managers, it can transfer files between your PC and mobile wirelessly. To use this feature, you will also have to install AirTrans on your iPhone or iPad. It allows you to do this task very smoothly. It is a new feature recently added in IOTransfer 3.3. In the past, I criticized for not having a similar feature. But, Now, The IOTransfer 3 Pro has this feature. You can manage your iCloud photos, videos right from this software. It is definitely a useful feature. This one is another cool feature. You can view the installed app list on app manager. Then, Uninstall multiple apps by a single click. It can help you in many ways. 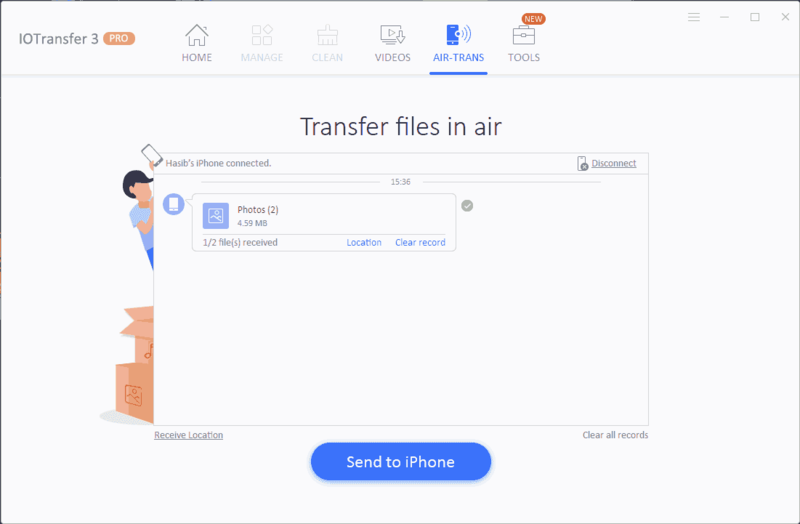 The IOTransfer can scan and clean junk files from the deep of your iPhone and iPad. It may help if you have old iPhones with low storage. It has some additional features that can bring extra benefits. One of them is video downloaded. Now, You can download and convert video using IOTransfer directly to your iPhone. Else, It has an Instagram photo and video downloader. It makes possible to save media files from Instagram to your iOS devices. GIF maker is another feature that can help you to create GIF easily. The user interface of IOTransfer 3 is great. It has probably the cleanest interface I have seen in similar programs. The simple UI makes it easier to use this software. You can navigate between different options very easily. You will find the most useful features in the home screen. Then, You can navigate between tabs for other functions. Overall, You will like the interface. 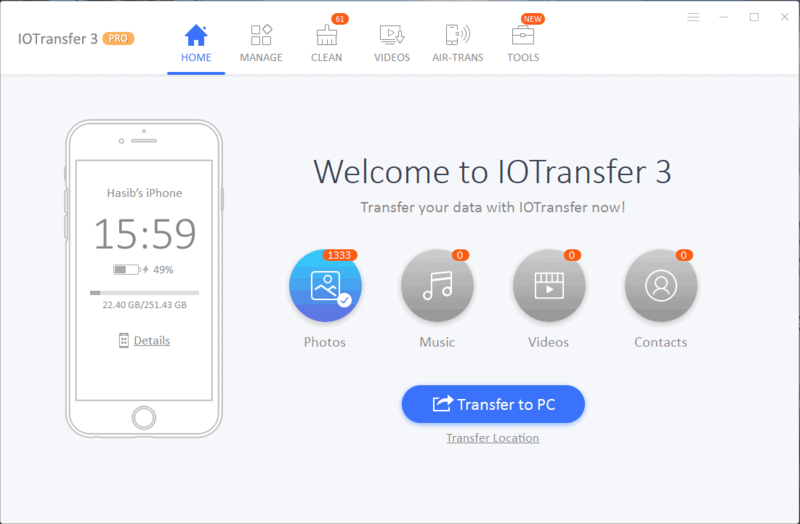 Personally, I have used IOTransfer 3 Pro. I see much improvement in this version than the previous one. File transfer speed was good. But, Sometimes, Wireless file transfer speed was slower than expected. Again, I noticed faster speed wirelessly. So, It may depend on your WiFi power. Or maybe it is the software that has an issue. But, Overall all other features worked perfectly. I have not faced connection issues. When you connect the iPhone, the IOTransfer 3 can detect your iPhone very fast. But, Sometimes, It may take a while to refresh contents which is very common in most other similar software. Overall, Performance was good enough for me. No doubt, the IOTransfer 3 Pro is a great software. But, It still has flaws that I have not expected. It has iCloud photo manager which is great. But, It doesn’t have iCloud explorer. As a result, You will only be able to access photos and video. But, You will not get access to other contents like contacts, reminders, and contents from the iCloud drive. Else, Some extra features like schedule air backup, ringtone manager, etc. are missing in this software. If we look at its price, it may be acceptable. But, It is still a weak point. The pricing of this software is very good. It is not expensive like all other iPhone managers for PC. The price starts at $26.99/Year. It also has lifetime license. By the way, You can get is just for $9.89 per year for 3 PCs by using the promo code “Tech Classy” during checkout. If you want to buy the lifetime subscription, the price is just $16.47 for 1 PC. It also offers a free trial. So, You can test the product before purchase. Note: You also can get a free trial. For this, Click here. You already have learned a lot in this IOTransfer 3 review. It is a software built for managing iOS devices from your PC and very easy to use. In fact, It is a better iOS transfer software rather than a true iPhone/iPad manager. You can use it to transfer photos, videos, music, etc. between iOS devices and PCs where it works best. If it fulfills your needs, you can buy it instantly. 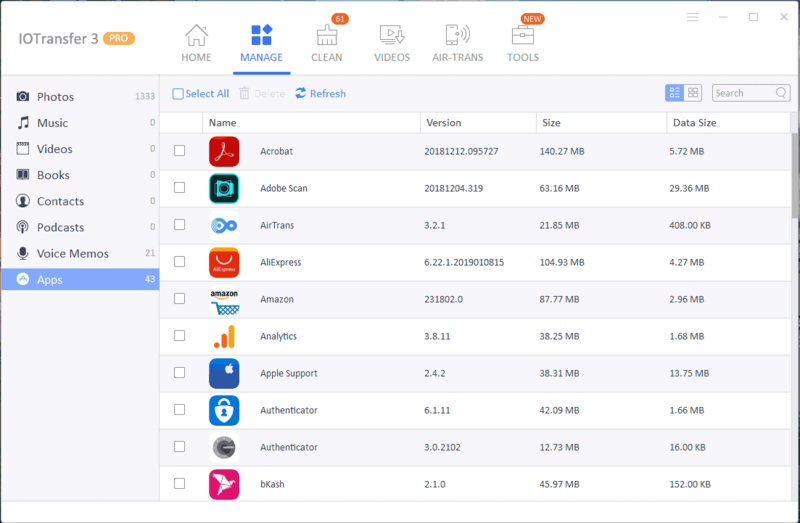 If you want much more features and don’t mind to raise your budget, you may go for iMobie AnyTrans which has so many cool features though the price is higher. iMobie AnyTrans Review – Is it the Best iPhone Manager?